• Earn $100 by opening any checking account with direct deposit. • Earn $50 by adding a debit card with CardValet. • Earn $50 by adding online banking with e-Statements. 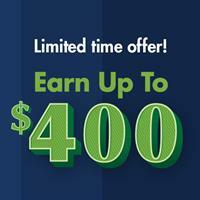 • Earn $200 by adding a relationship money market account with $10,000+. Take advantage of everything listed above and it all adds up to $400! Already have an account with Home Federal? Don't worry, you can still earn money! • Earn $25/friend when you refer a friend or family member to open a new account. There is NO LIMIT on referrals! * New account owners must not have been a HF checking account client in the last 12 months. Checking account minimum opening balance is $25. Money Market account requires a $10,000 minimum balance to open and to avoid a monthly fee. Rates shown are effective 01/01/2019. This is a tiered rate account and subject to change after the account is opened. If your daily balance is less than $9,999.99, the interest rate paid on your entire balance will be 0.05% with an APY (Annual Percentage Yield) of 0.05%. If your daily balance is between $10,000-$24,999.99 the interest rate paid on your entire balance will be 0.10% with an APY of 0.10%. If your daily balance is between $25,000-$49,999.99 the interest rate paid on your entire balance will be 0.20% with an APY of 0.20%. If your daily balance is between $50,000-$99,999.99 the interest rate paid on your entire balance will be 0.30% with an APY of 0.30%. If your daily balance is between $100,000-$249,999.99 the interest rate paid on your entire balance will be 0.40% with an APY of 0.40%. If your daily balance is $250,000 or greater the interest rate paid on your entire balance will be 0.40% with an annual percentage yield of 0.40%. Fees could reduce earnings. Any applicable reward(s) will be credited to the account within 60 days of meeting required qualifications. Qualifications must be met by 06/30/2019 (direct deposit must clear by 08/31/2019). $25 reward to client referring a new account will be credited to existing account of referring client within 60 days of new referred client meeting all required qualifications. Any applicable reward amount(s) will be reported as interest on IRS Form 1099-INT. Account ownership styling and transaction authority may disqualify eligibility to receive applicable reward(s). A $75 early closing fee will be charged by the bank if the new checking and/or Money Market account(s) closes within the first 6 months. CardValet requires the debit card to be activated. Clients with existing active online banking are eligible for $50 e-statement reward, but one reward to be given per client, not per account enrolled. A product type change from an existing Money Market will not qualify for reward. Health Savings Accounts are not eligible. Offers subject to change and may be withdrawn without notice. Member FDIC. email: Click to Get Started!